It was a torture watching the widely televised town hall meeting on government's plan to remove what it terms subsidy on petrol. I am sure the organizers wanted to present the impression that it was an engagement between Nigerians and proponents of the policy; on that count, they failed woefully. Aside from few interventions, there was hardly any thorough and clear position in defense of the mass of poor Nigerians who will be adversely affected by increased cost of petrol. Instead, there were escapist caveat and conditionalities, 'if you must remove fuel subsidy, you must do this and that'. I was particularly shocked when Ben Bruce was introduced as the Advocate- in- Chief of poor Nigerians! When did that transformation happen? Watching the Finance Minister Ngozi Okonjo Iweala show slide after slide to prove her point, I could not help but conclude that we had returned to the era of economic growth on graphs and bar charts alone, with no corresponding indicators on the price of Garri or Rice in the market. She argued that the 'landing cost' of a litre of petrol is N139, that fuel subsidy in 2011 will cost the government N1.4trillion; that that figure amounts to 30% of Nigeria's revenue, that Nigerians consume between 35million and 40million litres of petrol daily etc. However, what the Finance Minister carefully failed to mention however is what constitutes 'landing cost' of petrol. That term becomes relevant in the first place because the government has failed to improve the refining capacity of Nigeria. So rather than move crude oil directly from the oil fields in Nigeria to refineries in Nigeria and then to filling stations in Nigeria, the crude oil is moved from the oil fields, to sea ports where it is transported across the ocean, to distant lands, where duties are paid, tax is paid, profit margins are added, jobs are created and salaries are paid. Refined products are again moved across the ocean at high cost to Nigeria for consumption. Why does this happen? Because we have failed to build new refineries or service existing ones. This is not to say that monies have not been allocated and doled out for the periodic turn around maintenance of the refineries, indeed it has, and in billions too! But because the government has given those maintenance contracts to the very same people who import refined products into the country! Is there any doubt as to why the refineries are not working? And why have new refineries not been built? Simple, because 'government has no business in business" at least that is the view of the Honorable coordinating Minister. So rather than take the matter of building new refineries as top priority by the government, with realization that oil is the mainstay of the Nigerian economy, from 2000, the government licensed 20 new refineries to be constructed by private investors. None has done as much as placed the foundation 11 years later! About the quantity of petrol consumed daily in Nigeria, I am at a complete loss. A few weeks ago, it was quoted as 32 million litres. Imagine my shock when the Finance Minister gave the figure as between 35million and 40million litres! Wow! Our population must really grow rapidly or someone is being funny with figures, and why won't they inflate the figures, the whole cost of subsidy depends on how much fuel Nigerians consume daily. A few months ago, the 'Comrade' Governor Adams Oshimhole, (who by the way was on the government side in this debate) had cause to question the consumption figure presented by the government. He had said, "the number is crazy, even if all Nigerians are drinking petrol the way we drink pure water. How many litres do we consume? Who is taking what"? I couldn't have said it better! The government was at least bold enough at the meeting to admit that the consumption figure was incorrect. The CBN Governor (when he wasn't threatening and muscling Nigerians with Economic doomsday) clearly stated that the figure has been inflated on account of petrol neither imported nor supplied to the filling stations, but for which monies are paid. He barely fell short of admitting that the government has not really been subsidizing Nigerians, but itself and its friends. After all, who grants licences for the importation of petrol? Sanusi also mentioned smuggling of petrol into neighbouring countries as another factor that has led the increased consumption figure. According to him, Nigerian petrol is sold in Benin Republic and elsewhere and that this has been facilitated by bribery of government officials who aid and abet the process. And so? Does it make economic sense to punish Nigerians with increased fuel prices because government officials are corrupt and because the government has failed in its statutory duty of guarding the borders? I couldn't help but recall that this same argument had in the past provided basis for the Obasanjo administration to increase the price of fuel. Are they now admitting that effort under the supervision of Mrs Iweala failed too? How are we then sure this new effort will work? Does it not make economic sense to say that when prices go up in Nigeria, prices in Benin Republic will go up even higher? Doesn't it also follow that if that is the case, there will be higher profit in sending imported fuel to Benin Republic rather than Nigeria? If that happens, will we not return to the same old situation of petrol scarcity which will drive up the cost of petrol in Nigeria? It was also interesting listening to the Finance Minister on litres of petrol Nigerian car owners need. She obviously did this in an effort to show that the beneficiaries of fuel subsidy are higher income earners. If that was the intension, I was not convinced. For one she dwelt only on petrol usage by car owners and its effect on transportation. She carefully failed to mention the fact that perhaps equal or higher quantity of petrol is used daily in Nigeria to power millions of generators for living houses and businesses. Why? Because government has failed to provide power. When Mrs Allison Madueke talked about the thousands of jobs that will be created when the subsidy ends, again she failed to mention the millions of jobs that will be lost when the price of petrol goes up. Does it not make economic sense to say that barbers, tailors, hairdressers and millions of small scale businesses will either fold up when they can no longer afford to power their businesses or they will increase prices for their services accordingly? Does she not also know that 90% of Nigerians who live on less than N320 a day will not be able to afford higher costs? I couldn't help but note that Mrs Allison cited the example of China as a country that closed it borders for twenty years only to emerge economically more viable and almost at par with the United States. Wow! That was a real shot on the leg! When China closed its borders as the Minister recalled, the government of China took charge of all aspects of the economy, regulated every sector. Isn't that the exact opposite of what Madam Allison is proposing? At least twice in the debate, mention was made of success in the deregulation of the telecommunications industry. What was not mentioned is that NITEL lies dead now, that revenue that should have accrued from it is lost, that thousands of staffs have lost their jobs. It was also not mentioned that the profits from the new telecom carriers are not ploughed in Nigeria but are drained to other countries! After that it was the turn of the revered Central Bank Governor. I score him a pass in inciting fear. 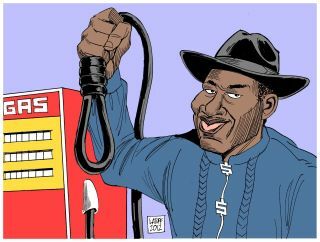 All the talk of how the Nigerian economy will collapse like Greece etc if fuel subsidy is not removed, did the trick. But on second thought, is he not aware that any person who lives on less than $1 a day as 70% of Nigerians are according to him is living in a collapsed economy? The truth is that for the vast majority of Nigerians, the economy collapsed long before the global financial crisis, and as they say, 'he that is down needs fear no fall'. For these Nigerians, increased fuel prices will not only mean a worsened economy, but outright annihilation. Sanusi further provided details as to how the 'landing cost' of petrol got so high. According to him, the government also has to pay for real and phantom demurrage by importers. Well isn't this happening because the ports have become a cesspool of ineptitude and corruption? And who is to blame other than the government. As the government has done severally in the past, Sanusi also blamed the entire situation on a 'cartel' in the oil industry that is adept at circumventing the process at every point. To this I ask again, since you know the cartel, why not just deal with it in accordance with the law? Because I could swear I saw one or two of them sitting at the front row observing the proceedings! Talk of insincerity. Speaker after speaker reeled what they considered facts as to how foreign investors will flock into Nigeria as soon as deregulation takes place. Again we are back to the same old rhetoric about foreign investment, that same elusive agenda that kept President Obasanjo globetrotting for a good chunk of his term in office. So where are all the foreign investors? It is not my place to educate our esteemed economists in government on the rudiments of investment, but I dare to do so. Investment thrives in an environment where it is secure. No investor wants to put his money in a clime where security is very much a challenge, where they run the risk of being kidnapped or worse still have their facilities bombed. On that count, Nigeria is not a favourite destination. Again, investors consider factors such as power supply and other infrastructure. No investor want to set up a business in a place where he will have to generate his own power, drill his own water etc. Given these facts, if any investor where to brave the challenges and set up a refinery in Nigeria, does it not follow that his production cost will be much higher than in other parts of the world? Does it not also follow that fuel prices may go up rather than go down as a result of higher production cost which itself is occasioned by government's failure to provide basic infrastructure and security? I am sure our distinguished government officials are aware of this facts but choose to keep it off the table of discourse. Perhaps the most interesting part of the meeting was when the government officials sought to showcase what government will do with the extra income. Extra income? Is there going to be extra income accruing to the country when subsidy is removed? The government says yes. But the same government officials say Nigeria has been borrowing to finance the subsidy, Sanusi even gave figures. Now, think about it. If we have been borrowing to fund subsidy, it simply means that government will stop borrowing for that purpose, but will not be saving extra income. Someone is definitely not telling the truth. The government says it plans to fund power supply, agriculture, maternal health, etc. To this I cannot help but reflect. What happened to the billions pumped into the power sector all these years? When it was revealed that there was corruption, who was put on trial? And agriculture, maternal health? All you have to do is take a look at all the loans Nigeria has received on behalf of these sectors, what has come off it? The government is quick to respond that this time will be different, that Nigerians should trust the current team of 'experts'. Maybe Nigerians should trust them the way we trusted them when crude prices went record high, the way we trusted them when with the excess crude account, the way we trusted them when they promised that $1billion will be saved annually and channelled into health care after the debt buy back deal in 2005. Talk of trust. The government promises this time will be different. A team of 'reputable' Nigerians will be drafted into a committee which will oversee the use of the subsidy savings. To this I am certainly not swayed, going by their definition of reputation in the last national merit award jamboree! All the debaters on the government side spoke so much about confidence in this new team of experts headed by Finance Minister Ngozi Okonjo Iweala. They begged Nigerians to trust them. Trust? Let's go a bit into history. In 2005/2006 when Nigerians were opposed to paying $12 billion at one go to the Paris Club of creditors, to write off debts which at best could be described as odious, they asked Nigerians to trust them. The same Ngozi Okonjo Iweala was Finance Minister at the time. Nigerians were promised that about $1billion will be saved annually from that exercise and that money will be plough into the same sectors which they are mentioning again! So what happened to that effort? Just to jolt your memory a bit, remember the following quotes? "The recent debt relief extended to the country by the Paris Club was another indication that the country's economic reforms were working"
"The link between debt-relief-induced resource availability for the improvement of economic and social infrastructure such as access to health, education and water on one hand and the attainment of the Millennium Development Goals (MDGs) in 2015 on the other is a natural one." "There is nothing like freedom-freedom from debt and the image that the debt relief and exit from Paris Club debt give to Nigeria . The debt relief has brought benefits to Nigerians and that it first represents a direct saving on debt-service repayment, interest, surcharges and other fees. It also improves the country's worthiness in the global community and builds credible financial confidence for transactions. More investment would start to flow into Nigeria knowing we are no more classified as a bad and doubtful debt country. The debt relief is expected to create jobs and new wealth with new investments, which would translate into improved standard of living"
The Comet, Friday, July 22, 2005. "It has become increasingly obvious that efforts towards the achievement of the MDGs cannot be separated from the issue of granting substantial debt relief".
" The debt relief will now provide the Federal Government and the state enough funds to embark on viable development projects with direct bearing on the citizenry. I am totally not in support of the Federal and state governments hence forth going for foreign loans for a project that can never see the light of the day in addition to projects that are not viable or those that cannot bring economic gains"
"This great and singular achievement will reduce the debt servicing burden on the National Treasury, thereby translating into the availability of more financial resources that could be channeled into vital areas such as education, health-care delivery, agriculture, water and power supply." " The fact that we have this debt reduction and we will be able to pay-off the balance of whatever is left will leave Nigerians free, to start on a new slate I mean it will be like a second independence, a rebirth, if you will, given us the freedom to focus squarely on our economic activities. It means that generations who would have been paying these debts in future will not have to pay it. And I think that is something that our children will appreciate and thank the President and thank the team and thank every one who has contributed to these all". "The real gain of $18 billion debt relief granted Nigeria by the Paris Club is the generation of economic activities in the private sector of the country. With this development, Nigeria could now experience new improved and greatly enhanced private capital flow into the country". Thisday, Sunday, July 17, 2005. "The $18 billion written off Nigeria 's debts which is almost two third of the nation's total debts, could be the largest ever debt write-off by the Paris Club. The debt relief package should help the country's goal of reducing poverty by making available some one billion dollars of debt service payment for improvement in social services including health and education. The comprehensive debt treatment, if fully implemented, has significant implications for debt sustainability, ongoing economic reforms and poverty reduction efforts, as well as removing the debt overhang, which has created uncertainty for private sector investment in the country"
"The deal will help to change the lives of millions of people in Nigeria . It will mean more schools, more teachers and better health services for a country which has the biggest population in Africa . The deal is major step in bringing about a better future for a country in which seven million children receive no schooling at all and one in five dies before their fifth birthday"
"If the money is to be used for immunisation, she (Mrs. Amina Ibrahim, SA to Finance Minister expected to monitor the utilisation of the funds to be so freed) and her team would make sure that children are actually being immunised. If it is for the purchase of books for school children, it would be tracked to be sure that the pupils actually receive the books. If it is for building of classrooms, it would be so identified,"
Six years after the furore, the government admits we are back in crisis, external debt has risen to $5.633billion and domestic debt stands at N5.313trillion. I ask, what became of the $1billion savings? The economic team pleads "no comment"! In all, what the advocates of oil subsidy removal have failed to show is what the actual cost of subsidy will be if government where to sit up to its duties, if all the channels of fraud and leakages are sealed. They have also failed to admit that it is the failure of government that Nigeria after over 5 decades of oil cannot refine to meet domestic needs. They certainly failed to prove how ordinary Nigerians will survive the crunch which will be engendered by increased fuel prices. What they definitely failed or chose not to understand is that for the ordinary Nigerian, the 'temporary pain' which they claim the policy will bring simply cannot be endured. Nigerians have been pushed to the wall for too long only two choices are left; drill the wall and disappear forever, or fight back. Your guess is as good as mine. Finally, an advice to government: fight corruption, arrest, prosecute and get offenders to return what they have looted, cut the huge recurrent profile like the N1billion proposed for feeding the President and Vice President in the 2012 budget and those costs which makes the National Assembly consume 25% of Nigeria's total overhead budget as Sanusi once informed us. I dare say, there will be savings enough to 'build critical infrastructure' and 'create safety nets'. Ken Henshaw is the National General Secretary of Nigeria’s United Action for Democracy (UAD).